This statistic presents the share of mobile phone website traffic worldwide. 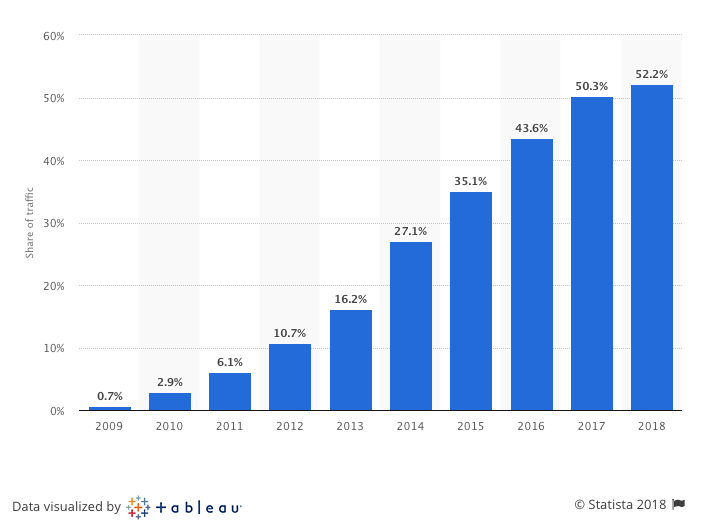 In 2018, 52.2 percent of all website traffic worldwide was generated through mobile phones, up from 50.3 percent in the previous year. Mobile currently accounts for half of all global web pages served. As of February 2017, mobile accounts for 65.1 percent of all web traffic in Asia and for 59.5 percent of all web traffic in Africa. Due to the strong growth of the smartphone market in recent years, this is no surprise, especially as mobile internet often provides a more viable online connection in regions that lack the infrastructure and money for traditional and more expensive landline connections.